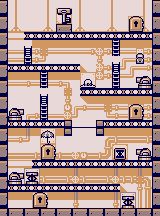 Stage 6-5 is the fifth stage in the Airplane in Donkey Kong for the Game Boy. The stage features many springs, cannons and even fake doors. Mario starts off on the bottom floor. He must head right over to a spring then bounce on it to get up to the next platform to the left, then head left while avoiding a cannon's shots to get over to the second spring. Mario has to watch out for the second cannon on the third platform, then he has the choice to either jump up high enough to reach the wire and Wire Spin up to the next area or use the Spring Block to bounce his way up. Once at the top area, Mario can choose to take left side which has a cannon, two ladders and is closer to the key, or the right side which has a cannon, one ladder, and two of Pauline's lost items. Once Mario picks a side, he must climb up to the last platform then go over to the key and pick it up, then he must make his way back down while avoiding the cannons' shots and not getting tricked by the fake doors. Once back down at the bottom he must go over to the real door with the key to end the level. Bag: Below the platform with the key and the fake door and above the cannon on the right side. Hat: To the left of the cannon which the bag is above. Parasol: Above the first fake door. This page was last edited on February 28, 2018, at 01:50.